By a / September 18, 2010 / . New York Times Sports’ #1 Most Emailed Article for two consecutive days. An art gallery sent crews into the cramped basement of a die-hard Steelers fan to box up his vast and eccentric collection of black-and-gold paraphernalia. Days later, on the second floor of the Miller Gallery at Carnegie Mellon University, the fan’s man cave had been reassembled, down to the last hand-painted action figure, bobblehead and toilet seat. Art Basel it is not. The man cave and nearly 1,500 unlicensed videos, T-shirts, sculptures and other objects make up “Whatever It Takes,” an exhibit that explores the culture of Steelers Nation and the personal relationship between the team and its fans. It is scheduled to run through Jan. 30 — or longer, gallery officials said, if the Steelers reach the Super Bowl. PITTSBURGH — An art gallery sent crews into the cramped basement of a die-hard Steelers fan to box up his vast and eccentric collection of black-and-gold paraphernalia. Denny DeLuca, left, in his Steelers man cave, which was moved from his basement and reconstructed as part of an exhibition at an art gallery. This is, after all, a town where football and cultural life are so intertwined that a life-size statue of running back Franco Harris’s Immaculate Reception greets airport visitors; members of the Pittsburgh Symphony think nothing of waving bright yellow Terrible Towels onstage; and Wiz Khalifa, a local rap star, recently made an ode to “Black and Yellow” his first single to break onto the national scene. One of the hottest tickets at the public theater is “The Chief,” a play celebrating the life of the team’s founder, Art Rooney Sr. Indeed, the Steelers’ heritage runs deep. Just as the team began to establish itself as a powerhouse, with four Super Bowl victories in the 1970s, Pittsburgh’s other dominant business, the steel industry, started to collapse. The Steelers captivated the city and the nation by playing the game the way their working-class fans lived: hard-nosed, tactical football that emphasized teamwork over showboating. Today, the city is seemingly divided along neighborhood, class and ethnic lines, yet Steelers fans transcend those barriers. What is more, the fan base has expanded beyond western Pennsylvania as former mill workers spread across the country and continued to bring their children into the Steelers’ fold. On Facebook, the curators found the Black and Golden Calf, a homemade mascot that is said to be the divine offspring of the Heinz Heifer and Steel Steer. They even canvassed 60 tattoo parlors in the region, where they found Steeler Ron, whose body is inked from head to toe with images of local landmarks and his favorite players. Earlier this month, in one of the Miller Gallery’s largest openings, some 500 visitors wandered through the two-floor exhibit — a group more familiar with the work of Trai Essex (an obscure lineman) than Tracey Emin (a contemporary artist). Many came wearing jerseys as if they were headed to Heinz Field. And instead of wine and cheese, they nibbled on pretzels and nursed Iron City beer. The show’s centerpiece is Denny DeLuca’s 252-square-foot man cave. On the bookshelves are 80 homemade Steelers action figures including an underwear-clad Roethlisberger tossing a beer and Santonio Holmes making his Super Bowl-winning tiptoe catch. Three Rivers Stadium, one of the Steelers’ former homes, is represented by a steel beam and turf from the south end of the field, and the toilet seat from DeLuca’s favorite stall. “It went under my coat at the final game,” he said. Many other objects were just as strange. By the entrance, a projector showed a montage of 70 YouTube clips and other videos highlighting fan rituals. One featured a parrot squawking, “Here we go, Steelers!” Others showed a woman applying gold eye-shadow on game day and a recitation of a Steelers version of the Lord’s Prayer. Sitting nearby is a Jacuzzi-size model of Heinz Field built by a group of electric football league fans. It shows Rooney making the rounds in the press box and President Obama, who grew up a Steelers fan, waving a flag in the stands. Rob Dalmasse, who spent two weeks constructing the model with his in-laws a few years ago, said he was proud to have it on display in a gallery setting and hoped to find it a permanent home in a Pittsburgh museum. On the exhibit’s second level, a black-and-gold wall map outlines the reach of Steelers Nation: the 50 states and 27 countries. All told, the curators identified more than 1,800 bars where Steelers fans congregate, including Blozik’s Blitzburgh Cave in Serbia and Botticella Birreria in Rome. 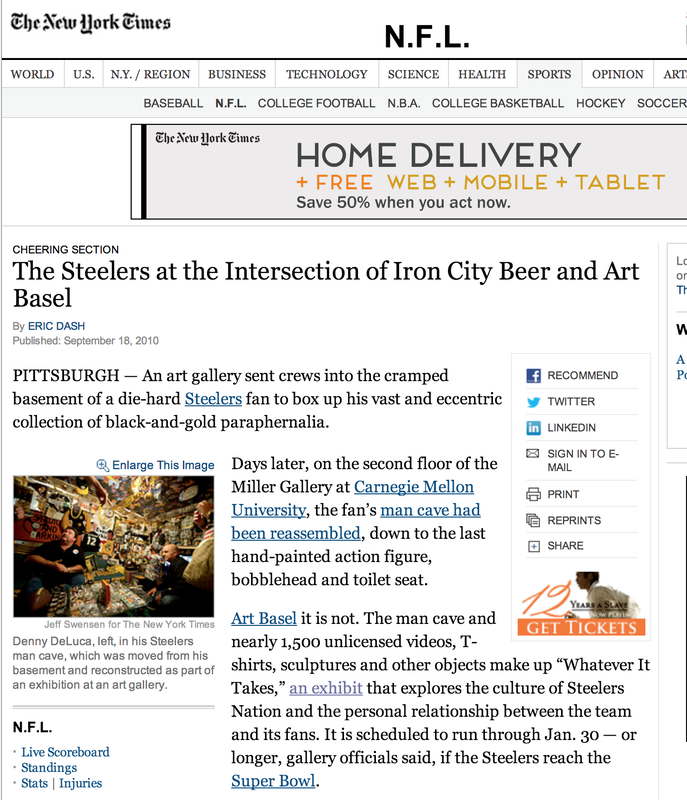 Steelers fanaticism, the curators said, is perhaps rivaled only by the reverence of “Star Trek” followers. Before Pittsburgh’s season opener, however, Rubin received an automated phone reminder about Steeler Day at his daughter’s elementary school. All students, it said, were encouraged to wear black and gold.